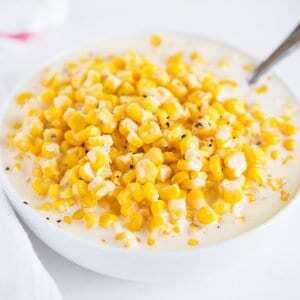 Slow Cooker Creamed Corn – Made with a secret ingredient to give this classic dish a twist! Super creamy, rich and has amazing flavor. 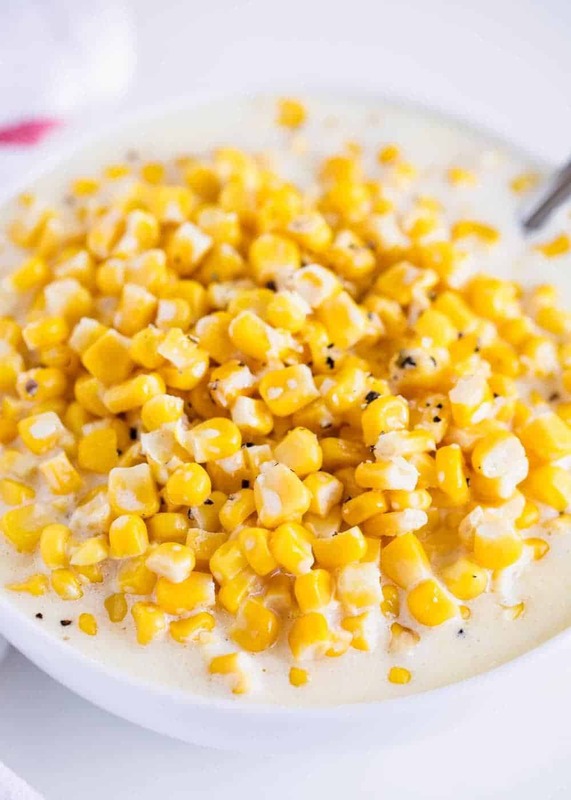 This creamed corn recipe is delicious and so easy to make! If you’re looking for an easy slow cooker dish to bring for Thanksgiving, this creamed corn is perfect for you! Prep time is just 5 minutes and you can throw it in and forget it. 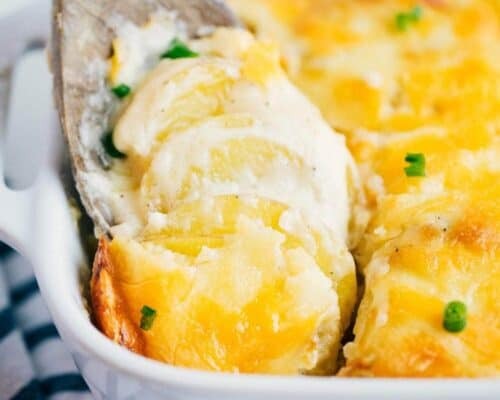 You’ll also love crockpot spiral ham, slow cooker mac & cheese and crockpot mashed potatoes. Today I’ll be sharing a twist on one of my favorite Thanksgiving recipes that my grandma always made. Creamed corn is one of those foods that I’m picky about. I don’t like my corn mashed and I definitely don’t like it to taste bland. This creamed corn recipe is definitely far from bland! 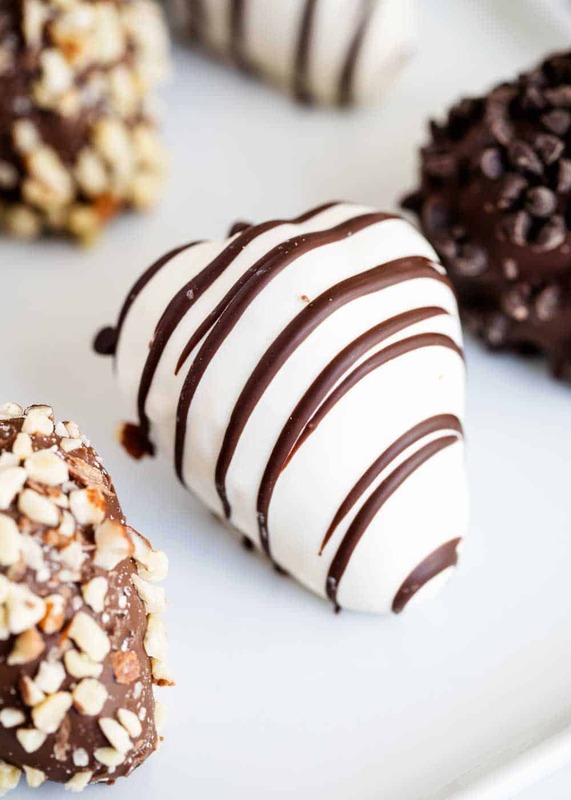 It combines all of the delicious flavors, making it nice and creamy with an amazing taste. If you do happen to like your creamed corn more on the mushy side…you can mash it up a little bit with a masher. But trust me, definitely try it this way! And yes, there may be half and half, butter and cream cheese. Shh…don’t tell! You won’t regret making this creamed corn recipe. 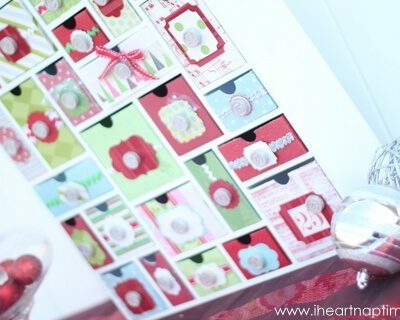 Definitely always a family favorite for the holidays. Can’t wait to enjoy Thanksgiving with family and friends. So much to be grateful for this year! 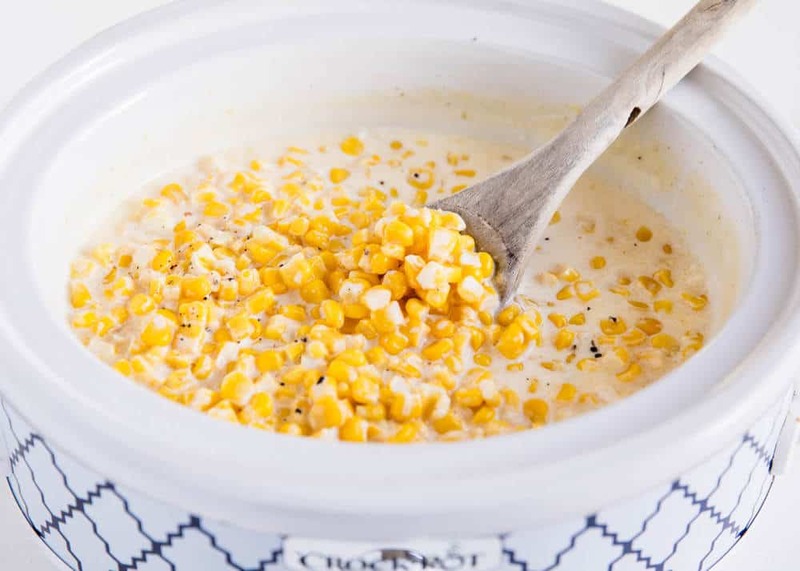 The secret ingredient that I added to this crock pot creamed corn is nutmeg. 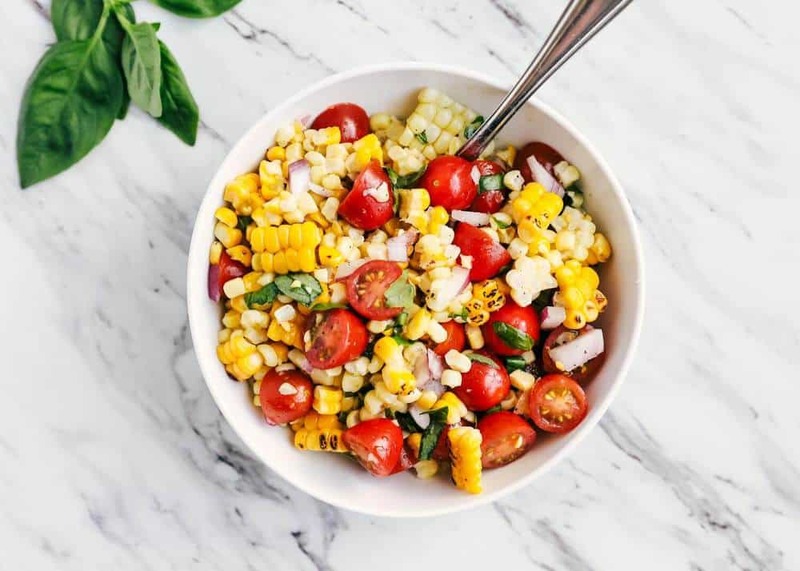 It’s not over powering, but adds the perfect subtle flavoring to the traditional creamed corn recipe (which can sometimes be a little bland). Scroll down for the printable creamed corn recipe. Add corn and half and half to crock pot (I used this 2 1/2 quart). Then place cream cheese and butter on top of corn, then add the rest of the spices. Turn crockpot to low and cook for 2 to 3 hours. Make sure to stir halfway in between. Salt and pepper to taste, then turn crockpot to warm until serving. 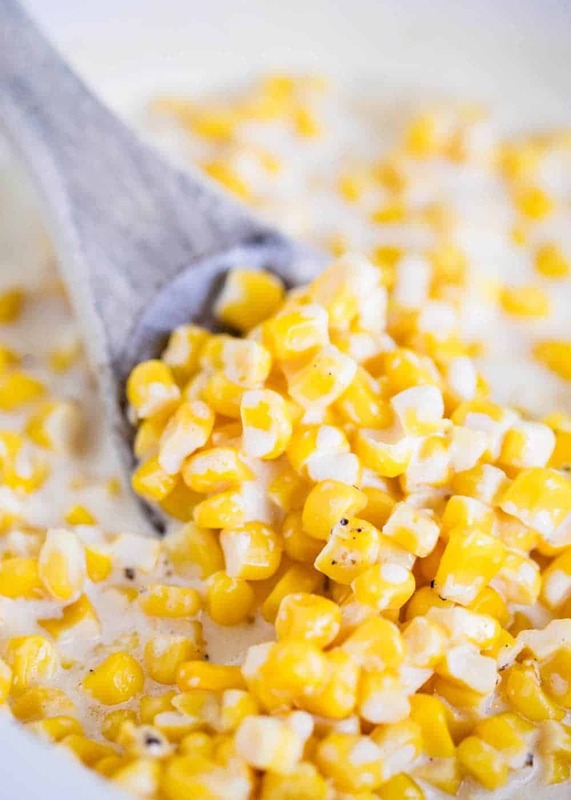 You could easily make this homemade cream corn in a pan on the stove if you prefer. If cooking creamed corn on the stove, I’ve found that using frozen corn works best. To start, simply add butter to a pan over medium heat and melt. Then add the half and half and cream cheese. Stir until the mixture has thickened and melted (about 7 minutes). Add in the spices and sugar and mix. Then add in the corn and turn heat to low. Simmer for about 15 to 20 minutes, until creamed corn has thickened. 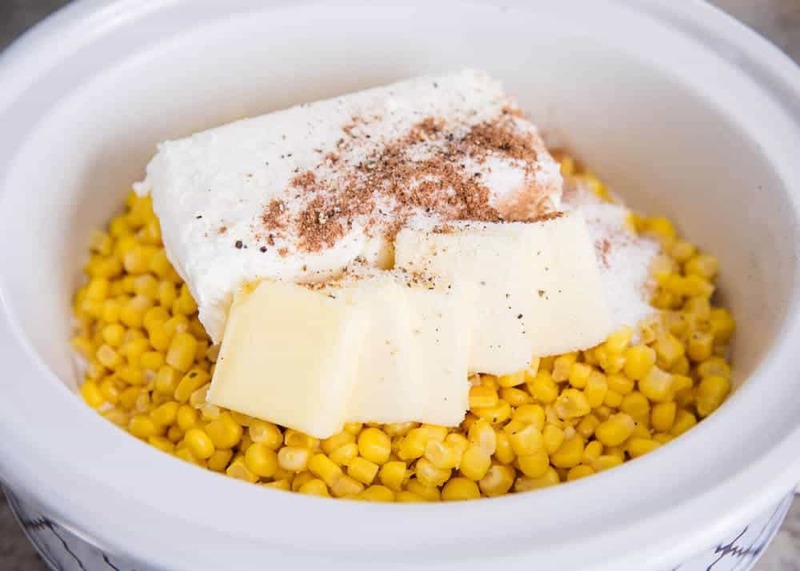 Slow Cooker Creamed Corn - Made with a secret ingredient to give this classic dish a twist! Super creamy, rich and has amazing flavor. 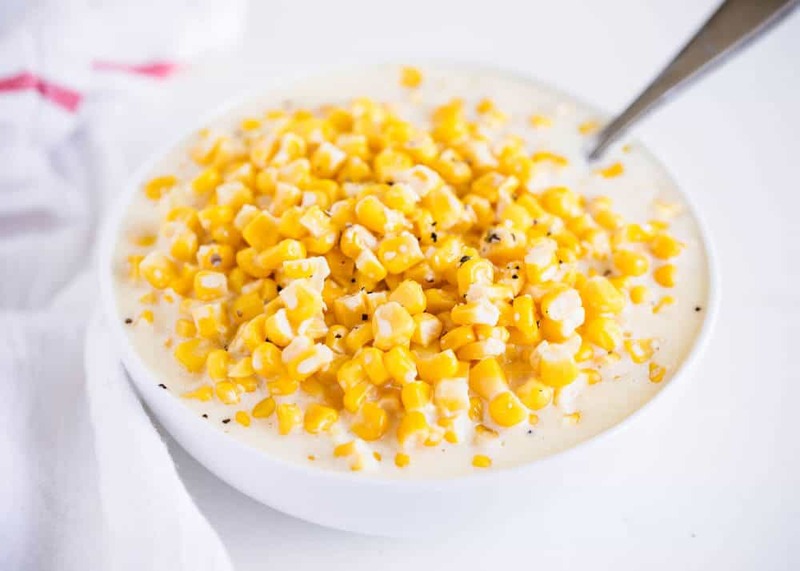 This creamed corn recipe is delicious and so easy to make! Place the corn and half and half into the slow cooker (I used a smaller 2 1/2 quart size). Then place the cream cheese and butter on top of the corn. Add the sugar, nutmeg, salt and pepper and cover. Cook on low for 2-3 hours, stirring half way in between. Salt and pepper to taste. Turn to warm until ready to serve. The creamed corn will thicken as it sits. So let’s hear it… what is your favorite side dish for Thanksgiving? This recipe is so delicious. I’m not a big corn fan, but I loved it. It was super easy to make to on a busy Thanksgiving day. Thanks. I don’t love the texture of canned creamed corn. This is so delicious! OMG, this is making me drool right now. LOL! I usually make boring plain corn for the holidays, but I love sweet creamed corn. I think I’m going to make this and surprise everyone at my Thanksgiving table this year. Hope you enjoy! Creamed corn is a favorite of mine on Thanksgiving! I made this last week and it turned out perfectly delicious!